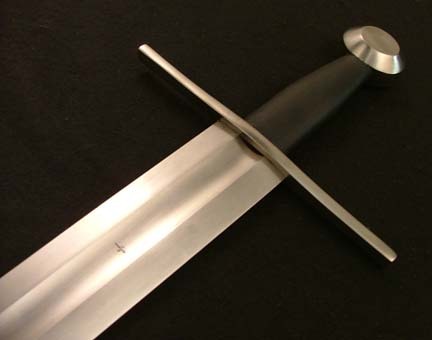 A sword of type XII, according to Oakeshott´s typology, is defined by having a broad and evenly tapering blade. It should have a good point and a fuller that is 2/3 to 3/4 of the blade length. This is perhaps the most classic of all blade styles. So much so that it is close to being the very archetype of the European knightly sword. The heft of the sword is managed by an effective use of nonlinear distal taper and a deep and well defined fuller. This results in a lively and responsive feel that invites you to strike with the sword. The outer third of the blade towards the point curves gradually to a sharp point. This gives a visual balance to the broad base of the blade and also helps in establishing sweet handling characteristics. These swords will not be sold sharp, unless otherwise requested by the customer (sharpening available for a small additional fee. ).The grip is of stabilized birch, wrapped with black leather.